Bill Pitsenbarger was born on July 8, 1944, in Piqua, Ohio. 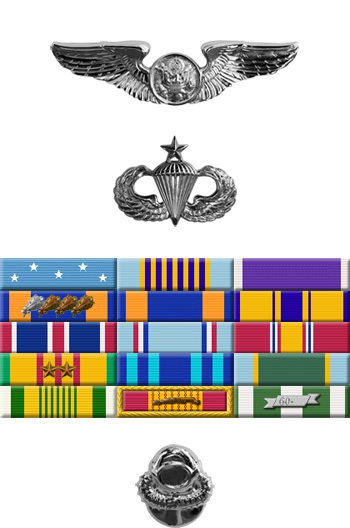 He enlisted in the U.S. Air Force on December 31, 1962, and was trained as a Pararescueman. 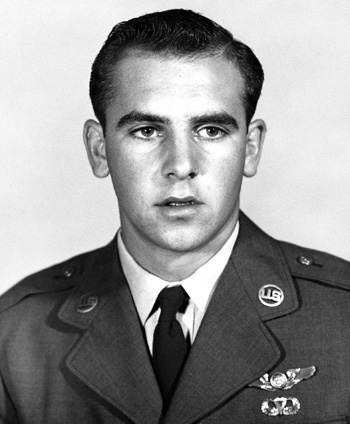 After training, Pitsenbarger was assigned to the 41st Air Rescue Squadron at Hamilton AFB, California. He served there from October 1963 until he was deployed to Southeast Asia in August 1965. Pitsenbarger served with Detachment 6 of the 38th Aerospace Rescue and Recovery Squadron at Bein Hoa AB in the Republic of Vietnam from August 1965 until he was killed in action on April 11, 1966. He was posthumously awarded the Air Force Cross for actions the day he was killed, and it was later upgraded to the Medal of Honor. Airman First Class Pitsenbarger distinguished himself by extreme valor on 11 April 1966 near Cam My, Republic of Vietnam, while assigned as a Pararescue Crew Member, Detachment 6, 38th Aerospace Rescue and Recovery Squadron. 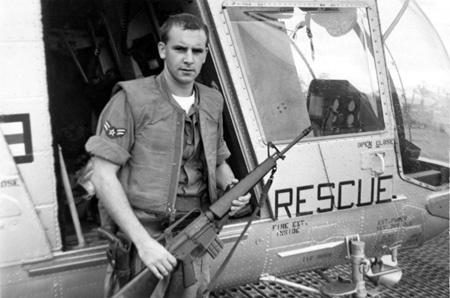 On that date, Airman Pitsenbarger was aboard a rescue helicopter responding to a call for evacuation of casualties incurred in an on-going firefight between elements of the United States Army's 1st Infantry Division and a sizable enemy force approximately 35 miles east of Saigon. With complete disregard for personal safety, Airman Pitsenbarger volunteered to ride a hoist more than one hundred feet through the jungle, to the ground. On the ground, he organized and coordinated rescue efforts, cared for the wounded, prepared casualties for evacuation, and insured that the recovery operation continued in a smooth and orderly fashion. Through his personal efforts, the evacuation of the wounded was greatly expedited. As each of the nine casualties evacuated that day were recovered, Pitsenbarger refused evacuation in order to get one more wounded soldier to safety. After several pick-ups, one of the two rescue helicopters involved in the evacuation was struck by heavy enemy ground fire and was forced to leave the scene for an emergency landing. Airman Pitsenbarger stayed behind, on the ground, to perform medical duties. Shortly thereafter, the area came under sniper and mortar fire. During a subsequent attempt to evacuate the site, American forces came under heavy assault by a large Viet Cong force. When the enemy launched the assault, the evacuation was called off and Airman Pitsenbarger took up arms with the besieged infantrymen. He courageously resisted the enemy, braving intense gunfire to gather and distribute vital ammunition to American defenders. As the battle raged on, he repeatedly exposed himself to enemy fire to care for the wounded, pull them out of the line of fire, and return fire whenever he could, during which time, he was wounded three times. Despite his wounds, he valiantly fought on, simultaneously treating as many wounded as possible. In the vicious fighting which followed, the American forces suffered 80 percent casualties as their perimeter was breached, and airman Pitsenbarger was finally fatally wounded. Airman Pitsenbarger exposed himself to almost certain death by staying on the ground, and perished while saving the lives of wounded infantrymen. His bravery and determination exemplify the highest professional standards and traditions of military service and reflect great credit upon himself, his unit, and the United States Air Force. A1C Pitsenbarger with his HH-43 Huskie in South Vietnam.